Hi folks! I've had lots of people ask about various details regarding how I did my helmet interior. So, I thought it may be wise to just summarize it all so others may learn things or try to replicate some/all aspects of what I did. My goal was to have all my electronics systems embedded inside my helmet, with individually switchable systems, whilst all being very clean and hidden along with a blacked out look. No problem right? Ok so I quickly found out that it would take quite a wall of text to summarize how to do this build, so I decided to throw a video together to summarize it all instead! 1) Black out your bucket as you desire, I used 1/4" thick neoprene to line it. 2) Create a junction box by leveraging your hovi bolts onto a custom backplate which your switch box also get screwed into. 3) Refine your project box so it has the right size and number of switches for your application (I have 3 subsystems, others may have more or less). 4) For every one of your systems make a custom harness where the electronics run through your switch to its power source, ensure that the switch is the only mechanism to turn it on (so if the electronics had their own switch keep it stuck in the on position and let the switch you use at the project box be the one that controls it). 5) Using high quality velcro, mount all your electronics up at the top, and/or your fans at the bottom. 6) Route all of your wires that need to run from your electronics down to the switchbox in a clean loop, and everything else tied down neatly at the top. 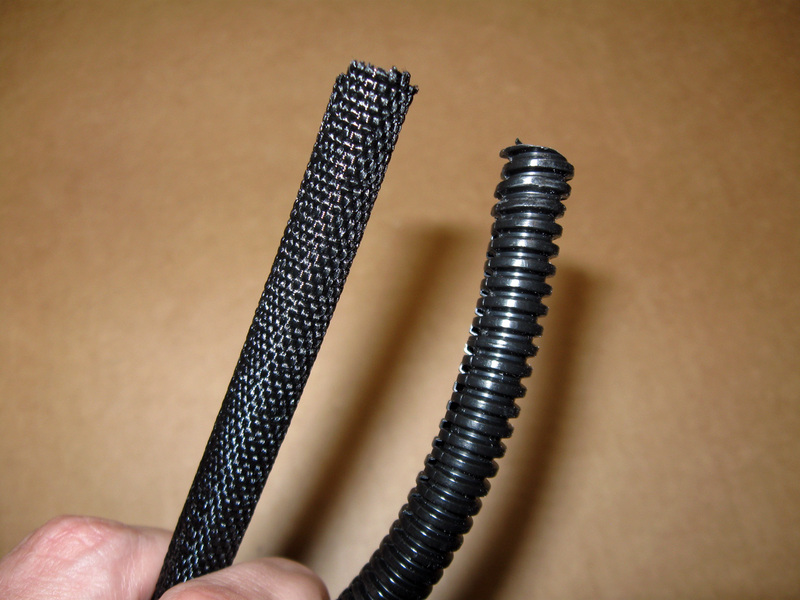 Use tubing to wrap the wiring with the least amount of wire and tubing required. 7) Add velcro to the bottoms of your electronics at top and add black padding to hide it all and make a comfortable fit. 8) Use any extra helmet padding as necessary to ensure you have a solid and snug fit. 9) Optional step: You may want to do this at the start but have your eye lenses done up in a manner that will work well with the clean look of your interior (see my other howto to check out how I did mine). Here are some helpful detail shots that highlight some of what I was referring to within the video. One shows all the bare electronics before any lining or hiding was performed at the top. Another shows a detail of the swicthbox at the bottom to show how the hovi bolts and the project switch box mount into the backplate. All right folks, enjoy and I hope this helps you with your own helmet builds. Post any questions or your own interiors! Oh my, oh my! Congrats!! Love it so much!!! I'm genuinely amazed you can fit all of that AND your head in there! That's a lot of stuff you've got in there. Very tidy. OMG is right. Man, I think of all the years I had a single donut on top and nothing else. In retrospect, I never did put the helmet on in the video to prove I can also get my head in lol. But yes, of course I can. Even better is that it is a perfect fit. The offset the electronics and padding creates at the top is exactly at the height I need to have my head aligned in there right so my eyes are perfectly lateral to the socket centerpoints. Moreover, the four additional helmet padding I placed near my cheeks and ears causes a very snug fit, it isn't floating or going anywhere as I move my head around. Also, the depth the junction box creates actually rests against my chin gently creating a four point lock system. Anyway, I'm certainly a happy camper it all worked out and thought maybe all this demonstrated work could help others in their endeavors to create something similar. I wasn't knocking it's an impressive feat. For reference if I put that on I'd be blind and have a mouth full of switch box! Oh for sure, I didn't interpret it as a knock I just thought it was funny I never actually put it on in hindsight, or even turn the electronics on to demonstrate the sound either. And absolutely, making this work meant making the positioning and offsets of all electronics/padding/etc work with my specific head. And that's a good point to make because anyone trying to do a build like this will need to keep in mind that your positioning will likely differ a bit. There are smaller 12V box options (ones that don't need 8x AA), you can reduce the size of the iComm by removing it's box, so on and so forth. That said, I think most should be able to do this type of thing with their helmets with the right trial/error and planning. I was lead to believe the RSP helmets run smaller than most so if that's true than other helmets may actually be easier to pull this off. Wow! Thanks for sharing and putting all the effort in getting a video done as well! It's amazing! 1) Where is the speaker located? And the mic? 2) How do you charge things, or change the batteries? Looks like you have to remove a bunch of padding every time, is that right? 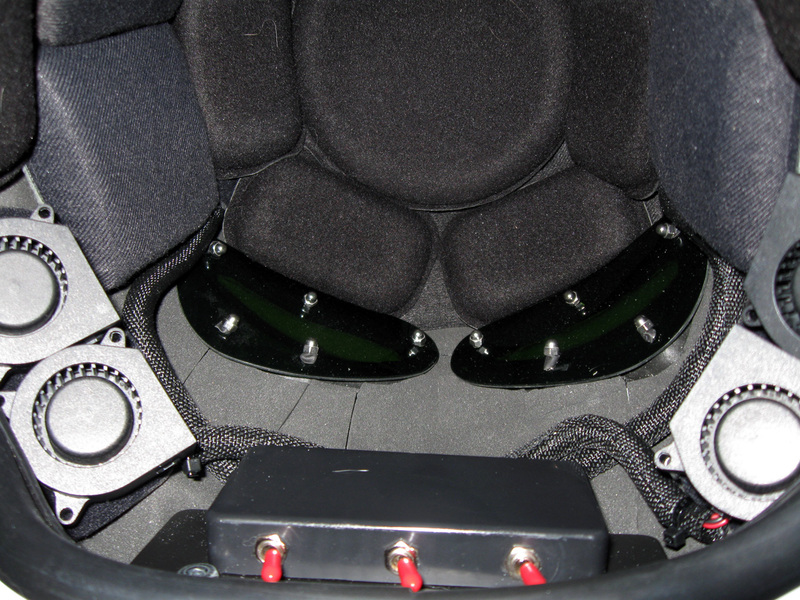 1) The mic is actually up at the top with the iComm/Aker under the padding, the output speakers are inside the hovi tips. The mic does not need to be at your mouth, a powered condensor mic is plenty powerful enough to pic up all your input up top under padding and you even want to cover the mic some to make it the right sensitivity not to pick up feedback from the speakers which are so close to it. 2) Charging the Aker or replacing batteries in the boxes up top is very quick and simple. I just remove the padding but that takes like 30 seconds to do/undo. It's all just Velcro'ed in so it's quite fast to get access to or put back. I'm not using Ukswrath's kit, but his would work fine as well since you're ultimately going to hook up some type of speaker to the 3.5mm output jack of the Aker. I used an Aker MR1506 in my build. If you don't want to do too much DIY then I think buying a kit where the hovi's are all ready to go like in Uk's kit is the way to go. Oh, I already have Uk's kit (with iComm), plus a ROM F/X (I still use Tony's speaker tips, but not the other electronics). Just looking at other options, since there's always room for improvement. Anything I'm demonstrating here can pretty much be done with any combination of electronics you have for your set. The basic gist is how to mount and hide your kit using some tricks that I try to illustrate herein. Yes, of course, I got that; I was just curious about the details of your electronics kit, since it was not completely one of the "usual" kits we often see. New and different caught my eye, especially combined with tried and true. Sorry for the sidetrack. Oh no worries. I do have a rather custom build electronics setup too, but the purpose behind this particular thread was how to go about actually hiding all of what you have inside in a clean and fairly hidden manner. With all the options either "off the shelf" or home grown, the other variable I was presented and often questioned about is how to get it all in a helmet in a clean and seamless manner. I was hoping to answer that particular question here in some flavor, since I think being able to put it all inside your helmet without actually seeing any of it exposed was a neat thing and worthy of a guide. What is the Aker used for? So the Aker's takes the output feed from the IComm, amplifies it and outputs it to the speakers. I love your build. How did you install the lenses? Thanks again for these posts and your reply. I have another question if you don't mind, did you cover the mouth holes with your neoprene? Or is it just not in the pictures? I do something a bit differently. I craft a piece of steel that is the shape of the mouth and bend it so it can lay inside laying "flat" against the teeth with the appropriate bend in the middle. I paint that flat black, and mount it with Sugru such that it is offset by 1/4" from the teeth opening. The Sugru rubber "feet" it lays against are visually hidden from looking through the teeth at the front. On top of the back side of this plate goes the neoprene. This seals the mouth off entirely and gives a very nice structural depth to the teeth mesh versus having it see-through. Pictures are hard to do this justice but I'll see if I can't find a good angle that illustrates the end result. One more question if you don't mind. I bought the battery, switches and fans. From the switch, do you split it 4 ways for each fan? Or run them in a strand like Christmas tree lights? No I run them in parallel, not series. This provides constant voltage to each fan and allows me to quick disconnect one or more if I just want 2 for instance, or doesn't shut the whole loop down if one breaks, a problem with your christmas tree style series lights.